In January 2019, CG&A COMMUNICATIONS celebrated its 25th birthday. To commemorate the occasion Chris George reflects on the company’s development. This is part one of a five-part series that chronicles the challenges of the company’s fledgling first five years. Twenty-five years ago, everyone was fascinated by O.J. Simpson driving on a L.A. freeway, Forrest Gump providing life’s secret in a box of chocolates, and watching the plot twists of two new television series, ER and Friends. In the year 1994 commercial sites began to appear on something called the World Wide Web, mass marketing campaigns began ‘spamming’ via e-mail, and the White House launched its first website. It was certainly a different world we lived and worked in. The origins of Chris George and Associates – later to be coined CG&A COMMUNICATIONS – are found in entertaining, after-work discussions along Ottawa’s Elgin Street. That’s where Lisa Hingley and Chris George committed to starting a public relations consultancy that would build on their public relations experience acquired through years on Parliament Hill. In the summer of 1993, Lisa and Chris began taking steps to ‘hang out a shingle’ upon the completion of the Fall 1993 federal election. In December the new business was registered and, in January 1994, CG&A COMMUNICATIONS officially opened its doors. Inspired by the success of good friends Nathan Rudyk and Peter Vanderlee, and their business model at Mindshare Marketing Group, CG&A COMMUNICATIONS was designed to become a virtual corporation, built with a network of talented, freelance consultants. Within months of start-up, the company offered a full range of communications services. Much of 1994 and 1995 involved fostering work relationships with like-minded communications consultants. The firm’s first office space was a small room with two desks, a desktop computer, a futon, a filing cabinet, a line of bookshelves, and a blue shag rug. E-mail had just been introduced to the workplace, and our primary mode of communications was still the fax machine. CG&A COMMUNICATIONS’ main office expenses in those early days were fax paper (purchased by the roll), cross-city bike couriers and postage for our promotional mailings. Early drafts of work were penned. Our office in the first six months was anything but a beehive of activity. Gus Zygoumis, Ottawa businessman and owner of Dustmoon Maintenance, was CG&A COMMUNICATIONS’ first client. Gus’ generousity and encouragement through the first year is still greatly appreciated for it provided us with the income to get our legs underneath us. We wish to take this opportunity to thank Gus and Martha for their support and friendship! Likewise, the early contracts from Mindshare Marketing Group provided much needed cash flow for the business. Working alongside Nathan Rudyk was both rewarding and an education. Nathan’s vision regarding business opportunities with the advent of the Internet helped set our firm’s core service offerings. Mindshare’s success, providing both traditional marketing and Internet-related services to private and public sector clients, was proof-positive that we were experiencing the dawning of a new era in public relations. In those earliest, most challenging times through 1994-95, we thank Nathan and Peter for all that they shared. Early contracts during those first years included communications services and office support at Queen’s Park and Ottawa City Hall. Though no longer gainfully employed within the political process, both Lisa and Chris were active in politics at all levels of government. We were involved in a number of political campaigns, including the highly successful and triumphant 1997 Ottawa Mayoralty race for Jim Watson. It was during this period that Lisa met and befriended Fraser Anderson – who was to become CG&A COMMUNICATIONS’ longtime webmaster and Internet consultant. In the mid-1990s, three specific contracts helped to mould the company into a full service public relations business. First, CG&A COMMUNICATIONS with its network of consultants won an extensive RFP process against more than 100 of the country’s PR firms. In 1995, the Ottawa International Airport was being privatized from Transport Canada and established as a community-run business. 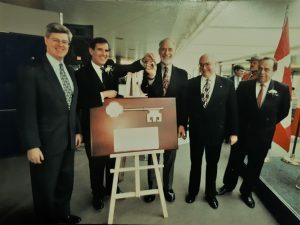 (Photo: Minister John Manley officially handing over the airport terminal key to the Ottawa Airport Authority.) On the strength of our team and our strategic approach to positioning the new airport entity, CG&A COMMUNICATIONS became the public relations firm of record to manage everything from the airport’s official opening and launch of its website, to its media and government relations efforts, as well as the promotion of terminal upgrades such as the new U.S. pre-clearance facility. Second, the company secured government and public relations work from Mothers Against Drunk Driving (MADD Canada). In the beginning, MADD’s Executive Director Jim Wideman had the desire to establish a presence in Ottawa, and then Chairman of the Board Tony Carvalho took the necessary steps to develop MADD’s strategic plan for government and public policy. Chris was initially called upon to manage the public policy agenda – and, within a few years the firm assumed responsibilities for creating and producing much of MADD’s print products, supporting the National President’s tour, managing government relations, directing national media relations, event planning, and building and managing the national website. For fourteen years, CG&A COMMUNICATIONS played an integral part in the communications and public policy activities of this renown, Canadian charity. Third, CG&A COMMUNICATIONS became the government and public relations agent for Ottawa’s newly opened Perley and Rideau Veterans’ Health Centre – a 450-bed, long-term care facility for veterans and seniors with dementia. For almost four years, our firm supported senior executives and the Board in their challenges to attain proper government funding; positioned the Health Centre’s services within the National Capital Region’s evolving health care scene; and, promoted the new facility within the veterans’ community and the greater public. Our communications support included everything from facilitating tours and presentations for MPs and community leaders, to providing strategic counsel and wordsmith services for the on-going challenges faced by the Health Centre. In five short years, 1994 – 1998, CG&A COMMUNICATIONS had grown in stature as a reliable and creative public relations company. With a core of five consultants, we were juggling three major accounts, a half-dozen more clients in Ottawa and Toronto, and a small network of associates. To our great satisfaction, we had survived the trials of being a start-up and were confidently fixed on our firm’s development and growth.